New homeschoolers often ask for recommendations for the “best” homeschool curriculum. They want to do a wonderful job educating their children, and they want only the best tools and resources. If you’ve been to a homeschool convention lately then you know that there is an abundance of resources and curricula. In fact, choosing a curriculum or publisher is overwhelming and might make you feel like you are loosing your mind. This is why many homeschool moms ask homeschool friends for a recommendation. Well, I’m here to tell you that I’ve found the VERY, VERY BEST homeschool curriculum. I possess the Holy Grail. I have found the secret! the one that actually gets done. I’m sorry if you’re disappointed. But that is the secret to homeschool success – finding a curriculum that gets done in your own homeschool. All the most wonderful, most recommended, most highly sought after, most expensive choices are nothing if they sit on your shelf collecting dust. You might find that a curriculum is too much, too little, too overwhelming, too complicated, too simple, too time consuming, or too boring for you. If so, then this is not the best homeschool curriculum for you no matter how widely it is praised by others. 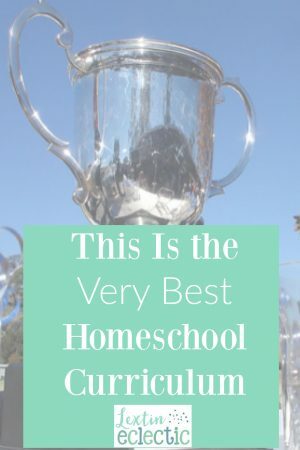 So how can you find this very best homeschool curriculum? Do you like to plan or do you prefer a curriculum that is planned for you? Do you prefer to teach with textbooks, workbooks, living books, or with online material? Do you understand your children’s learning styles? Have you outlined your homeschool goals and determined which subjects are a priority? Are you choosing resources based on your children’s passions? Are you choosing resources that appeal and make sense to you as the teacher? I’ve discovered that I like curriculum that is fairly open-and-go. While I do enjoy doing some planning, I need something that is complete and doesn’t require multiple extra resources. I prefer hardcopies of products to minimize printing. I avoid using online resources and try to stick with printed copies of resources. In the elementary years I’ve chosen our priorities as reading, spelling, and math. Therefore, I spend more time on those subjects while letting history and science be more laid-back and interest driven. As my children get older, foreign language and writing becomes a larger focus. Then the focus shifts to literature, history, and science. Knowing our goals and our focus helps guide my curriculum choices as I know which resources will be a larger portion of my budget. My children prefer to learn through books and reading with fewer projects or activities. They even enjoy the occasional workbook. This helps me guide my choices as I look at options. In your quest to find the most perfect homeschool curriculum, you will make a few mistakes and missteps along the way. Look at these moments as learning opportunities. You’ve now found a curriculum that is not perfect. Evaluate why this curriculum failed at your house and then choose something different the next time. And also know, what worked perfectly for one child may not work as well (or at all) for another. The very best homeschool curriculum for you is out there, it just takes research and possibly trial and error to find it. Want to read more about choosing curriculum? Do you need help choosing curriculum?